From the first few pages, I was pretty certain that Sarah Mae and Sally Clarkson had both been spying on me during my first few months as a mother… and, you know, the five years that followed in Toddler Town. When they share their experiences as new mothers and as “veteran” moms with more than one little one running around, they share honestly and genuinely. Being a mother is HARD, and so often, it’s hard in ways we never dreamt it would be before we found ourselves in these parenting trenches. They share, from a conservative Christian perspective, how they’ve dealt with resisting formulas when it comes to raising children, how they’ve grown as women as they’ve become mothers, and how they’ve clung more closely to the Lord through the challenges. I appreciate that in all of their amazing, wonderful advice that they refrain from giving advice. What? Yeah, their advice is centered around grace — giving grace to your children, receiving grace for yourself, and resting in God’s grace as you navigate this parenting road, rather than giving you a list of perfect standards you can’t possibly meet anyway. In reading their encouragement, I feel more confident that I can be who God designed me to be for my children, even as I feel inadequate to the task most days. The book also comes with little bar codes (is that the word?) at the end of each chapter that will take you to a video on your phone. I haven’t tried them out yet (too busy reading through it at an alarming pace — it’s just that good! ), but they’re there, along with links to the same videos online. I believe there’s also a DVD curriculum to go with the study, if you’re reading this and thinking that it sounds just perfect for a group of young moms that you know. 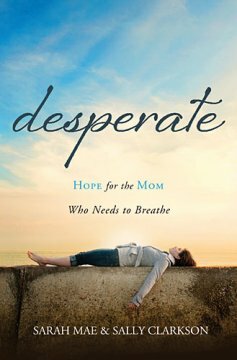 Moms, get this book, and BE ENCOURAGED!